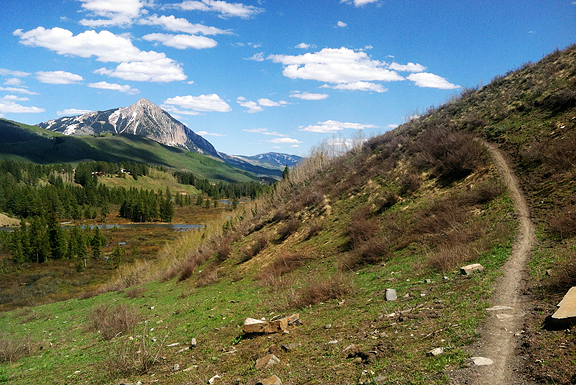 It’s quiet here in Crested Butte, where summer has yet to take hold in the high country. 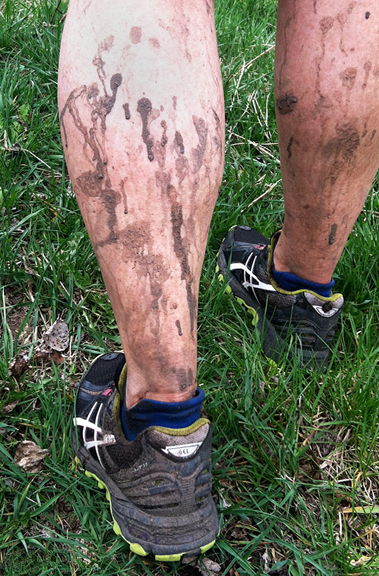 Conventional thinking says Memorial Day marks the unofficial start of summer, but the reality is that it is still mud season in our mountains. 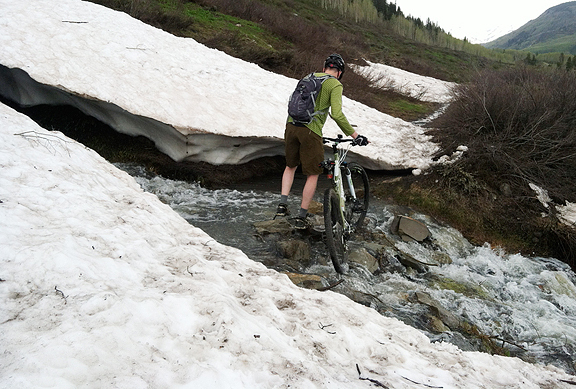 Most trails are in the process of drying out while local mountain bikers are chomping at the bit to ride something other than the handful of trails that are “open”. There is no shortage of parking on Elk Avenue, the main drag in town. I’m ambivalent about this time of the year. 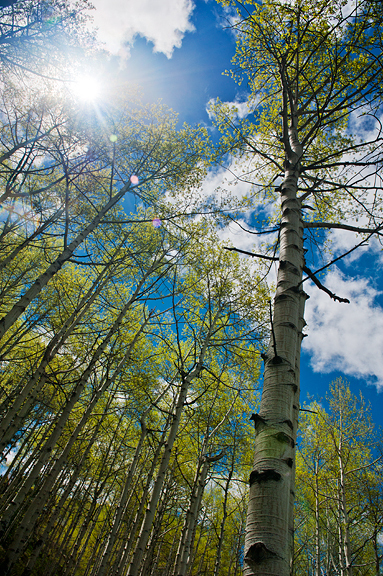 We want the local businesses to do well, but we also love having the trails to ourselves when the aspens are leafing out in their yellow-green new growth and the early season wildflowers start strutting their stuff. 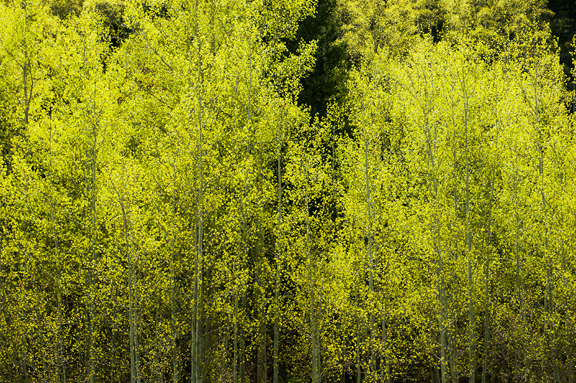 We’re here to de-winterize our place and do the necessary maintenance on things like the yard and the garden. Window screens are going back up and the flannel sheets have been laundered and folded away for the next four months. But we’re not just here for those things. 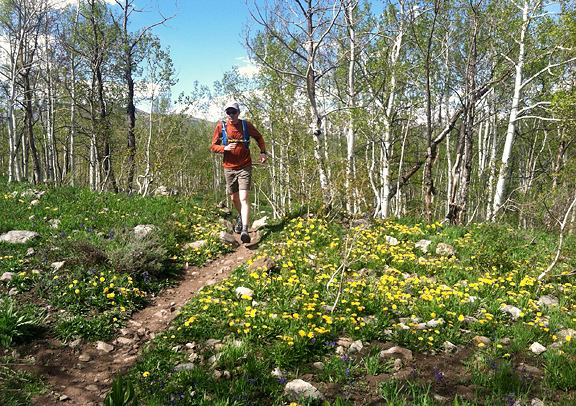 We’ve been trail running, mountain biking, and hiking. In fact, we were tipped off to a gorgeous locals’ trail that climbs into good huckleberry and potentially porcini territory! And much to our surprise, Kaweah made it to June. May was stable for our girl, and that’s about all we could ask for. We didn’t think she’d be coming with us to Crested Butte this time, but she made the trip and has absolutely loved lounging about on the soft lawn and smelling the odors on the mountain breezes while we clear out dead flowers from last year. If she lies in the yard for long enough, the birds will land around her, picking up grass cuttings for their nests or kicking the dirt around in search of bugs to eat. It’s been tranquil. Following one of our trail runs, Jeremy and I made a beeline for The Secret Stash (I wrote about it a while ago) to grab a late lunch. He was all about the pizza, but I was craving a salad in addition to the pizza. In their old (tiny) location, The Stash used to have plated salads and my favorite was the Gringo Greek. Gringo, because it had lettuce. 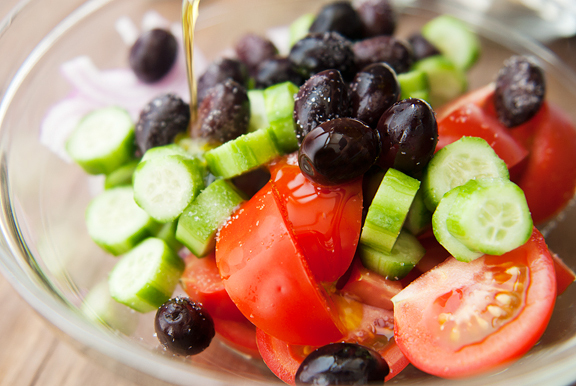 A proper Greek salad doesn’t have lettuce. 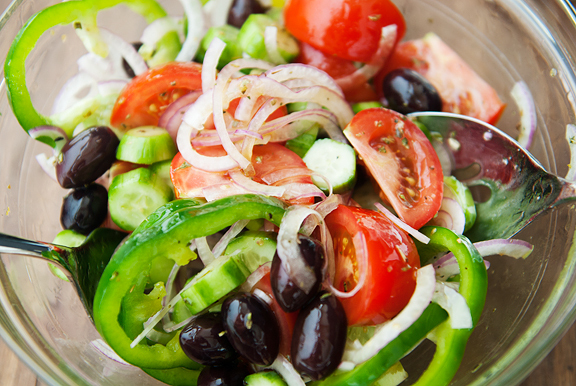 I love the proper Greek salad too, because it’s full of crunchy, briny, tomatoey ingredients. 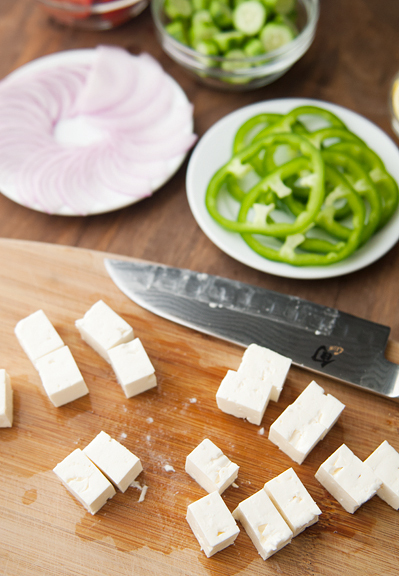 Making your own at home is so simple, so fresh, and oh so very good. 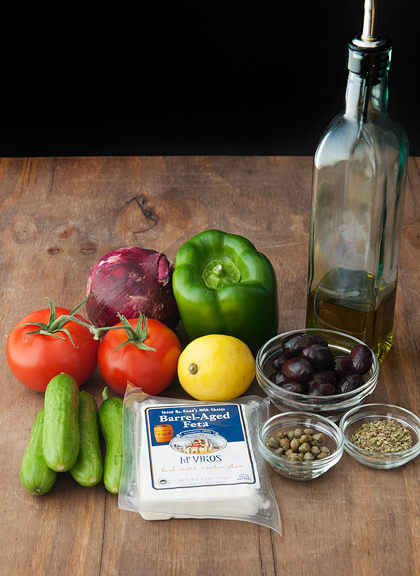 I consulted with a recipe from someone I deem an authority on all things Greek and delicious – Peter Minakas of Kalofagas. 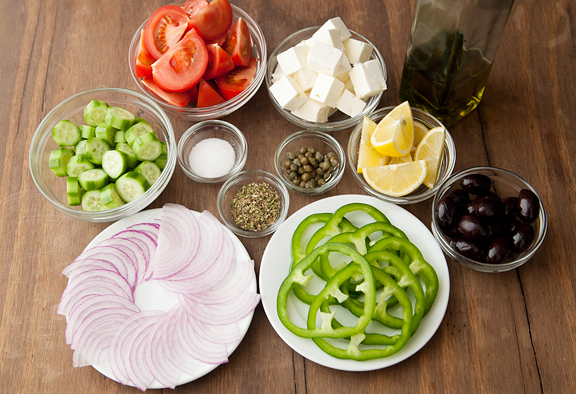 Now, anyone can make a Greek salad and Peter even has a few variations on his blog, but I was fascinated by this utterly simple recipe that delivers such sublime flavors. Peter did insist on a few things like getting a good block of Greek feta and using Greek oregano. Obviously you want to use a high quality olive oil, and ripe summer tomatoes will be superior to ANY other tomatoes. The lemon juice and capers are optional, but I’m a fan of both so they’re in my salad. I also use Persian cucumbers because I like crunchy cucumbers. 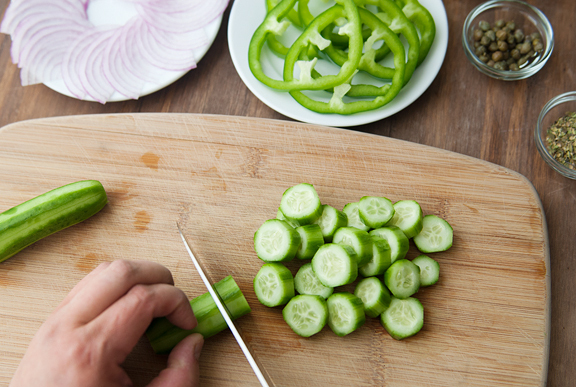 You can use slicing cucumbers if you like and peeling or not peeling them is entirely up to you. It’s such an easy salad to throw together. The most important part is sourcing quality ingredients and the salad practically makes itself. 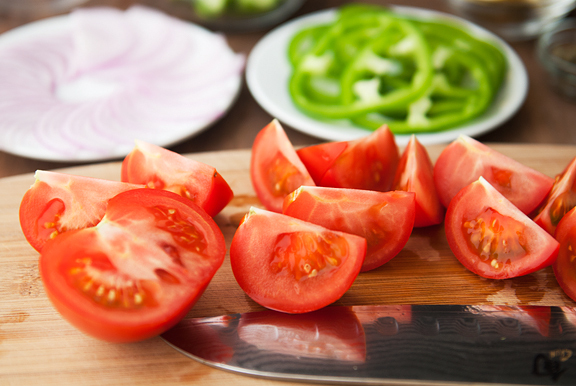 I think the key is to have ripe in-season tomatoes because that juice will mingle with the olive oil, salt, oregano, and lemon juice for the simplest and best dressing – the kind of dressing you want to mop up with good bread. 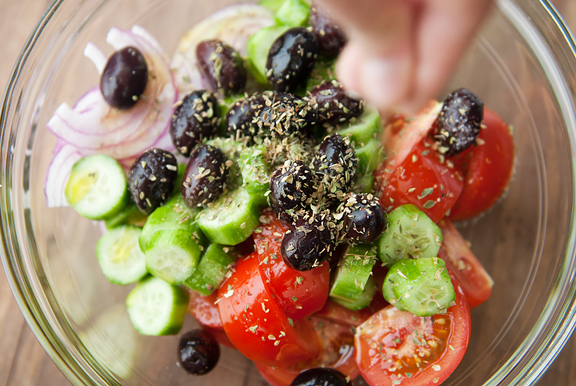 When I want a salad with big bites and bold flavors, a classic Greek salad comes to mind. It is especially appropriate in summer when the vegetables are at their best and are allowed to shine. And the beauty of it is that you can make it what you want. So definitely make this. 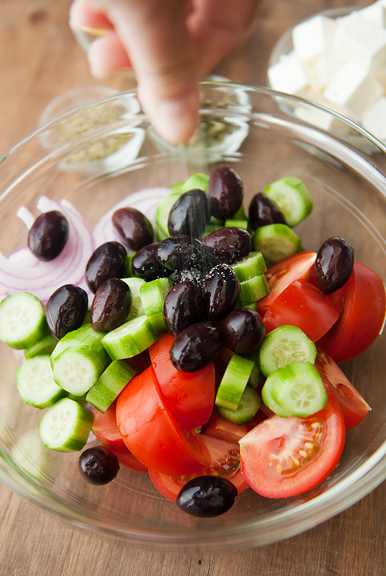 Combine the tomatoes, cucumber, bell pepper, red onions, and olives in a large bowl. Sprinkle with some sea salt. 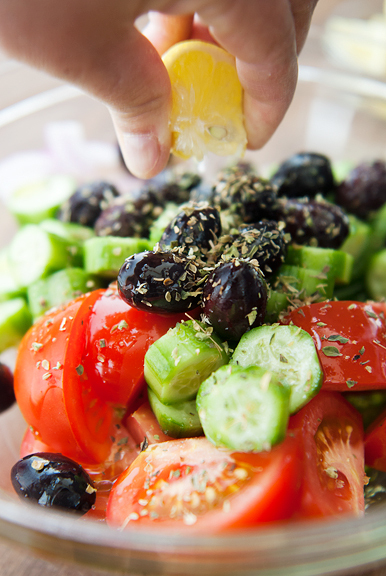 Drizzle some olive oil (1-2 tablespoons) over the vegetables and then sprinkle with half of the dried oregano. If using, squeeze some lemon juice into the salad. Gently toss the vegetables together until coated. 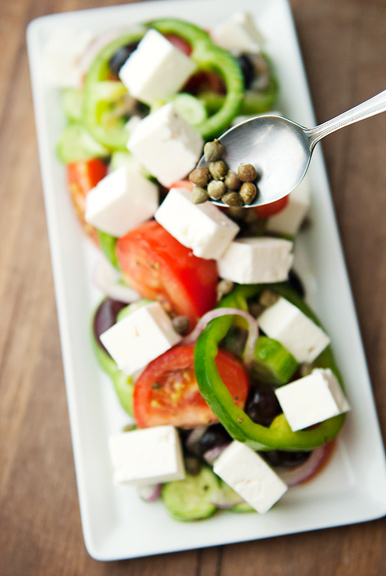 Arrange the feta over the vegetables and drizzle more olive oil and the rest of the dried oregano over the salad. Garnish with capers (optional). Serves 4. 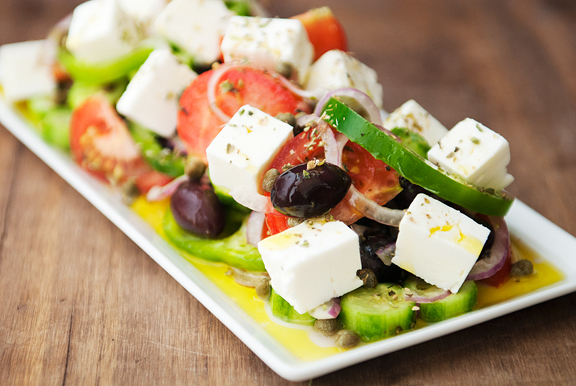 This is truly a great Greek salad! It does not need any thing else. I am Greek and I do know about Greek salad. That is as original as it can get. All you need now is some fresh baked whole wheat bread and you have a complete meal. 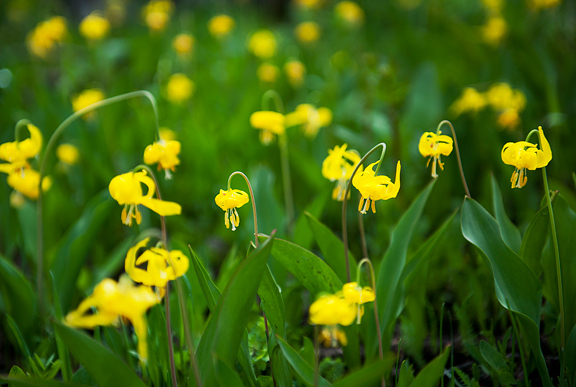 Thanks also for the beautiful blog and pictures, I love them! Looks like that would be great with some pita bread! Love all the pictures! Beautiful pictures as always!! And so happy to hear about Kaweah!! Happy Healthy thoughts to her! Love the recipe and the photos. 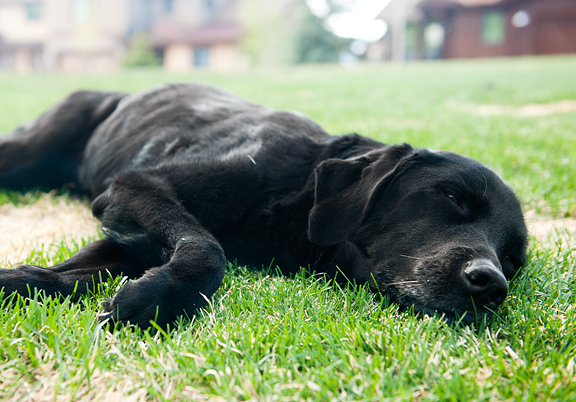 So happy to hear that Kaweah made it through winter and is once again able to nap in the grass and enjoy those wonderful Springtime smells. Jen, your writing makes us all feel as though we are right there with you. Thank you for all that you do for us. What beautiful country and a beautiful salad as well! Yum is right! If you guys are going to ride muddy, go cyclocross! :-) Our Miss Mocha would like to be get on the podium next to the champion napper for second place. 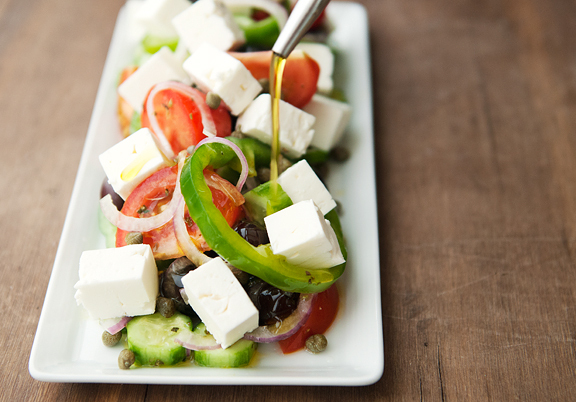 Mmmm…I’ve had so many mediocre Greek salads, that I usually overlook them. This is one that I will be making! Having been a runner (and still an Asics customer for my much shorter running these days), I am very curious about the water crossings. How do you avoid blisters? Is there a certain type of sock that you wear that helps? This looks totally perfect and summery – one of my favourite salads! cherie – ha! That is just awesome. At least he likes vegetables! Kristin – ah well, our climate is quite dry. I mean – dryer than most of California. 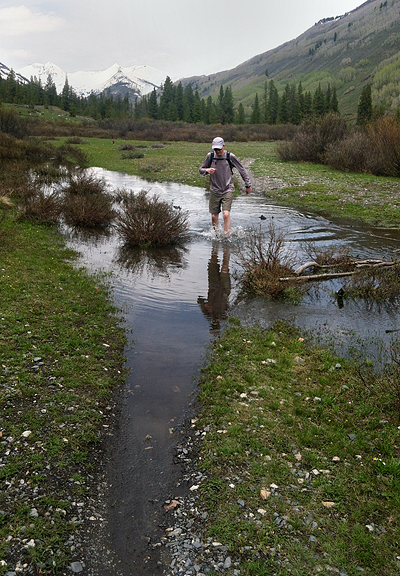 If I plunge through a deep stream and then continue running on trail, my feet will be dry within 10 minutes. The socks I wear are synthetic, fine weave, seamless toe, with target compression. I think that helps!